The video slots 2Can from the large Australian game producer Aristocrat offers players the potential to win nice winning jackpots. The game furnishes a screen of three rows, encompassing five reels and 25 total paylines. 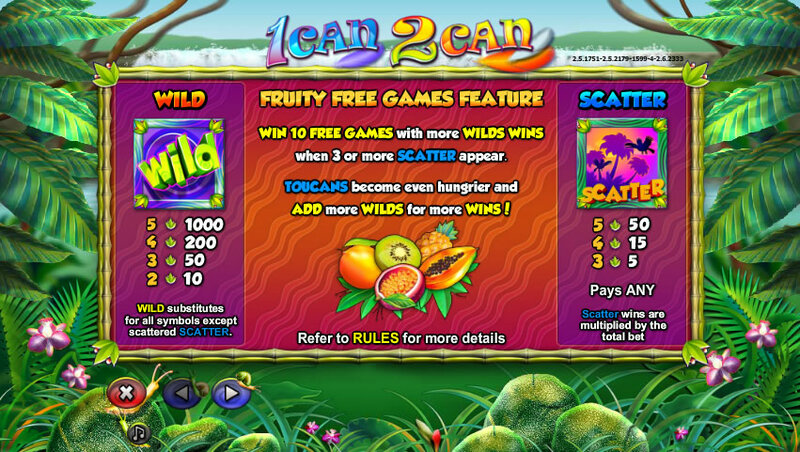 It offers several free game opportunities and a stacked wild card symbol, a lovely Toucan icon, that will substitute for every other symbol in the game to complete winning combinations (except a scatter icon). The game offers relatively small winning jackpots, but many opportunities to earn pleasant rewards from winning symbol combinations. A purple flower serves as the scatter symbol in older versions of the game. Five appearing on the screen offer 150 coins, four furnish 25, and three yield 5. The scatter will pay in any position and will give rise to free bonus spin opportunities. 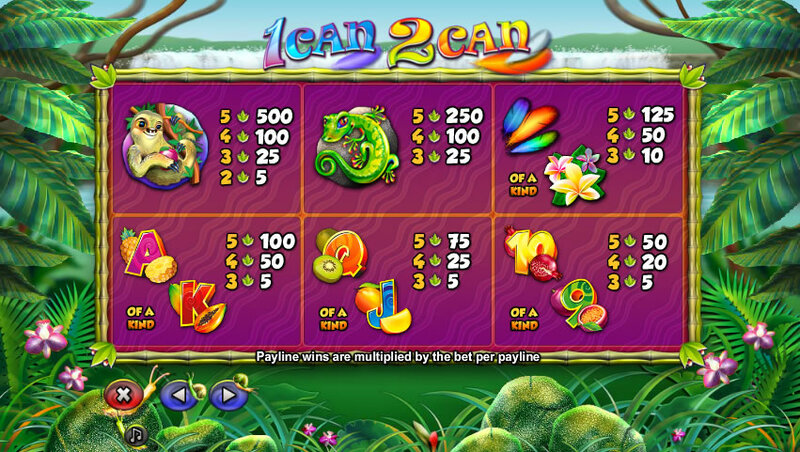 Three will afford a player ten spins, four offer 15 spins and five provide an impressive twenty free spins of the reels. During the free spin opportunities, when toucan icons appear in the reels they “stick” to the screen for the duration of that bonus session. The imagery in 2Can appears very impressive. The Toucan icons will animate and fly into place in some newer versions of the game. This impressive 3-D display lends visual interest to the slots. 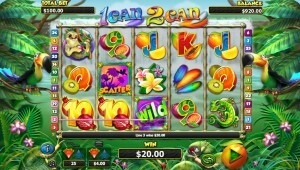 Additionally, toucan icons themselves potentially yield jackpots. Collecting five on the screen offers a maximum 2000 coin payout. Smaller numbers yield returns also, with four toucans paying 750 coins, three contributing 50 coins and even two rewarding players with 15 coins. In addition to the mobile birds, the other colorful icons in the game connote images of a lush, tropical paradise. In addition to the purple wild card symbol, players see cheetah, monkeys, frogs, iguanas and butterflies moving through the reels, beside standard playing card symbols: 9s, 10s, Jacks, Queens, Kings, and Aces. The bright colors contribute to the overall impact of the game. When winning combinations occur, some symbols animate. For example, number signs will flash briefly in unison. This visual effect probably contributes subtly to the overall entertainment value of the game. An standard autospin feature permits players to engage with this standalone non-progressive slots for extended periods of time without having to push the spin button repeatedly. 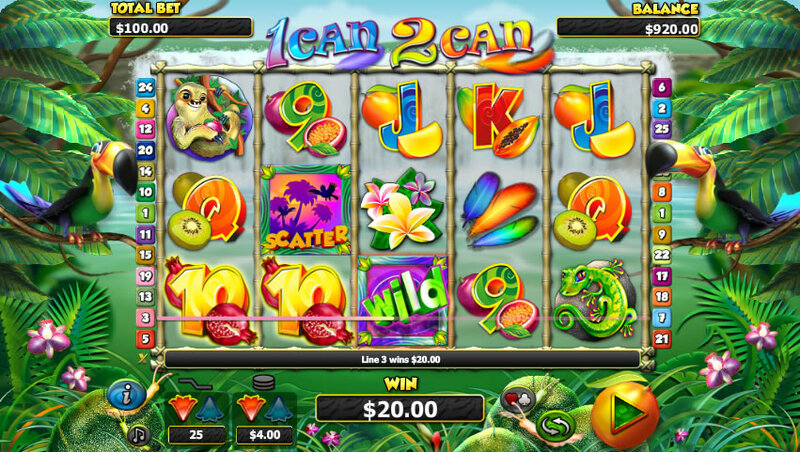 As an entertaining exercise, 2Can offers dedicated video slots players solid value. 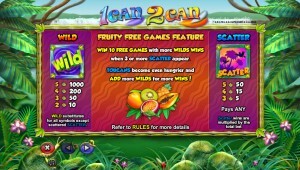 Many players will appreciate the opportunity to obtain generous numbers of free bonus round games. Additionally, the “sticky” properties of the flying toucans during bonus game sessions will probably encourage many players to keep playing in the hope of winning extra bonus rounds. 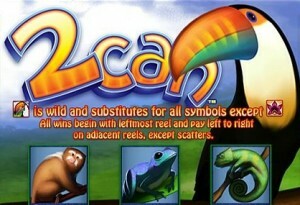 As bonus play continues, the number of toucan icons in the reels may increase. Players hoping for a jackpot will strive to collect as many of them as possible. The 2Can video slots demonstrates the considerable skill of Aristocrat’s design team. Perhaps due to its many entertaining features, this game has remained popular in casinos for some time. Its popularity will likely continue, although newer, more animated versions will perhaps reach players. Since computer graphics and animation improves at a rapid pace, 2Can doubtless will furnish ongoing entertainment opportunities for casino visitors into the future.